Fly fishing boots are in the middle of something like a revolution. For two hundred years, the biggest advancement the humble boot made was from a rubber sole to a felt one. Most boots were made of leather or a synthetic substitute, right up to about 1999. All of a sudden, the changes that took hiking by storm in the 1980s (lighter cloth, engineered flex points, a return to certain kinds of rubber soles) hit the wading boot market. Recently the Korkers company became the first fly-fishing manufacturer to stick the BOA lacing system on a wading boot, specifically the ‘Predator’ model. The BOA system was designed as a snowboard binding. It consists of a very small metal wire which takes the place of laces. To tighten, you twist a cylindrical hub (kind of like a capstan for you sailing types). Because the wire runs through small tubes instead of grommets or eyelets, tightening the “laces” applies even pressure across the whole binding instead of pinching over your mid-foot. Having field tested the BOA system, I can say that it certainly works as advertised, but it may not be enough of an improvement to make up for the hassle. The problem is, it takes longer to twist the hub (for me, around 10-12 twists on a size 10 Predator) than it does to tie shoelaces. While the binding is comfortable once it’s tightened, I’m not sure it’s an improvement over well-fitted laces. On the other hand, the system has one huge advantage: at the end of the day, you push a button and the hub releases; the whole boot opens like a snowboard boot. That means you can avoid the indignity of the one-footed hop trying to yank off a wet wading boot. You can also avoid trying to tie wet, frozen laces in winter-time; in fact, you don’t even need to take off your gloves to work the hub and tighten everything up. Moreover, fitting boots is notoriously difficult. I didn’t notice much difference in fit between the Predator and a laced boot, but my wife, Lauren, really preferred the Korkers and swore they were more comfortable. 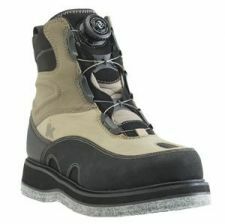 Have a comment about new-fangled boot design? Share it in the Comments section!